Monin's fruit purees are designed to be rich, flavorful foundations or toppings in a variety of drink recipes and dessert dishes. Made from real pureed fruit and pure cane sugar, they are bursting with the juicy sweet taste of fresh fruits. Flavored iced teas, lemonades, smoothies, slushies, homemade dressings, cocktails and more can all be made using these fruit purees, and the puree is shelf stable for greater convenience. Due to the wide variety of uses for these fruit purees, it is difficult to give a standard Servings per Container, as it depends greatly on the use. Most drink recipes call for 1-3 oz as part of 8-16oz drinks, yielding approximately 11-33 servings per bottle. Kosher, Halal, Dairy Free, Gluten Free, Vegan friendly. Blend 2 oz. Monin Banana Puree with 3 oz. plain yogurt, 2 oz. low fat milk, and 2 cups ice. Garnish to taste and appearance. Whisk together 1/2 cup Monin Peach Puree and a 1/2 cup maple syrup in a bowl. An amazing topping for French Toast, Pancakes, Waffles, and more! It is said that bananas originated in the area of modern-day Malaysia. Throughout the centuries, they've been successively cultivated farther and farther West - in America, starting in the late 18th century. With Monin Banana Fruit Pur�e, making banana drinks has never been easier. Featuring all the delicious taste and smooth texture of ripe bananas, Monin Banana Fruit Pur�e is a great option for adding sweet banana flavor to countless beverages. The scientific name of the peach is Prunus Persica because the origin of the peach was thought to be Persia (today's Iran). Modern botanists have since narrowed the peaches' origin to China. There, the peach was said to be consumed by the immortals due to its mystic virtue of conferring longevity to all who ate it. The ripe summer flavor of peach is ever-popular on menus. Peach teas, sangrias and smoothies are just some of the options offered by versatile, easy-to pour Monin Peach Fruit Pur�e. Strawberries have been enjoyed for millennia, having grown wild in Italy since at least the second century B.C. Among the Romans, the strawberry was a symbol for Venus, the goddess of love, because of its heart shape and red color. In medieval times, strawberry was considered a symbol of righteousness and perfection, as such, strawberry shapes were engraved inside cathedrals. Strawberries are very popular in desserts, ice cream, smoothies, lemonades and much more. 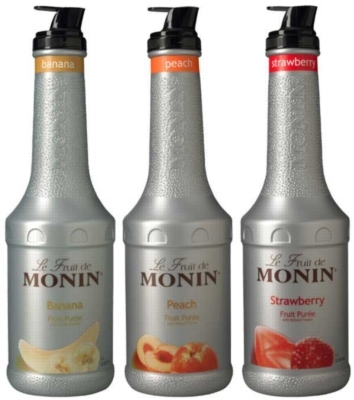 With Monin Strawberry Fruit Pur�e, making perfect strawberry beverages has never been easier!